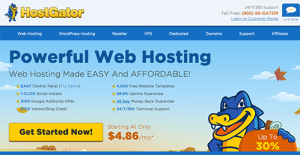 HostGator is a robust web hosting service designed for Wordpress. It is popular for offering flexible prices and many functionalities that are targeted at Webmasters. The platform likewise offers shared, virtual private server Web hosting and domain service packages, but it’s the service’s dedicated hosting services that truly sets HostGator apart from the competition. A giant in the web hosting sector, Hostgator is also ideal for use by entrepreneurs and individuals. It offers a superb dedicated hosting service that provides you with your very own physical server. You can run it on either Windows or Linux platform and the price stays the same, now that’s really cost effective. The service also provides plans that cater to those who run commercial websites, requiring more resources. Hostgator also offers VPS web hosting, where you share physical hardware with other clients, with your server running as a virtual private machine. This option can give you the functionalities of a dedicated server at a much lower price. For those who use Wordpress as a content management solution, the service will provide everything you’ll ever need to keep your site up and running at all times. It is designed to optimize websites running on WordPress. Each HostGator plan comes with cool freebies that you will certainly find very useful. These include 4,500 free website templates, free website building tools such as Weebly Site Builder, free site migration and transfer for scripts and MySQL. In addition, it provides free scripts that can be used with a single-click, with shared hosting plans entailing free advertising credits. HostGator offers a generous 45-day moneyback guarantee. One minus point is it does not provide any email security protection. But its customer support is reliable as the vendor provides 24/7 telephone support and online Web chat. HostGator rents data center space from The Planet, using four facilities in Texas. The vendor offers power back-ups, fire detection and constant monitoring to keep its 12,000 servers safe and secure. HostGator uses 10 different fiber providers, including hardware from Time Warner and AT&T. It currently offers a 99.9% uptime guarantee and an RSS feed for service status updates. All accounts (except dedicated servers) are backed up every week. If you need to restore a backup, HostGator charges $15, but if you supply the backup file yourself, it’s free. HostGator hosts more than eight million domains, and has a number of high-profile partners such as Cisco, AT&T and Dell. It does not allow overselling, so the capacity it gives is the capacity you actually get. The exception is on a VPS or dedicated server where you’re free to oversell at your own risk. How Much Does HostGator Cost? HostGator uses cPanel as its control panel. The cPanel comes with a 1-click installer for popular scripts like WordPress, Weebly and Joomla and Weebly. These freebies initially help newbies in setting up their websites without having to deal with any advanced control panel functions. HostGator offers users easy-to-understand video tutorials to make them familiar with how cPanel works. This speeds up the time it takes for users to get associated with the control panel. Unlimited bandwidth, disk space, and email accounts. Every business has its own characteristics, and might need a special solution that will be fit for their company size, type of clients and staff and even specific niche they cater to. You should not count on finding an ideal service that is going to be suitable for each business regardless of their background is. It may be a good idea to read a few HostGator reviews first and even then you should remember what the hosting service is supposed to do for your business and your workers. Do you require a simple and straightforward hosting with just essential features? Will you actually use the complex tools needed by pros and large enterprises? Are there any particular features that are especially practical for the industry you work in? If you ask yourself these questions it is going to be much easier to get a trustworthy service that will match your budget. We realize that when you make a decision to buy Hosting Services it’s important not only to see how experts evaluate it in their reviews, but also to find out if the real people and companies that buy it are actually satisfied with the product. That’s why we’ve created our behavior-based Customer Satisfaction Algorithm™ that gathers customer reviews, comments and HostGator reviews across a wide range of social media sites. The data is then presented in an easy to digest form showing how many people had positive and negative experience with HostGator. With that information at hand you should be equipped to make an informed buying decision that you won’t regret. HostGator’s offers comprehensive support options including 24/7 live chat support, a FAQ, email support or phone support (it offers a toll-free number within the US). Support and billing is offered through a portal where customers can log in to upgrade their account, access user forums, search the knowledge base and view helpful video tutorials. This account login is separate from the Cpanel login. In addition, transfer requests are handled via a quick online form. What are HostGator pricing details? HostGator gives a 99.9% uptime guarantee. Yes, HostGator offers WordPress hosting. HostGator offers plans that include SSL certificates and private IP addresses as well as support for many popular storefront applications. The vendor has Safe Harbor certification. Servers have protection with large mod_security rulesets and extensive custom firewall rules that guard against DDoS attacks and hackers. Hosting plans are offered with SpamAssassin to protect email accounts. No, HostGator does not offer a free domain with their hosting plan. All shared plans offer unlimited email accounts and bandwidth. Dedicated servers and VPS offer unlimited email accounts, while space and bandwidth depend on the chosen plan. Shared plans offer cPanel while dedicated servers and VPS offer cPanel and WHM. HostGator accepts all major credit cards as well as PayPal. Do they let you quickly set up a website without any HTML or coding knowledge? With all hosting plans, the vendor offers Site Builder, a free app with hundreds of templates that helps users of all skill levels to easily create a website. Yes, HostGator offers both Windows and Linux hosting services. I am a developer and I buy domains frequently. I used HostGator a few years back and I think it is one the best hosting provider. Comparing with some other big name HostGator is above of all. Support is super fast and they always respond on time and quickly!